MAIN CHARACTER STEFAN BUTLER MEETS with game production company, Tuckersoft. When you think of the phrase “choose your own adventure,” more likely than not, what comes to mind are those old books you used to read as a kid. Personally, I read R. L. Stine’s Give Yourself Goosebumps series, which revolved around flipping through a small paperback book to continue a then-scary thriller. Netflix’s Black Mirror: Bandersnatch is a movie that elaborates on that concept, opting to make the viewer act as a director and physically select where the plot will go at set intervals. When the movie comes to a major decision, the action pauses for ten seconds, and the viewer is presented with two options. Whichever one is selected dictates the course of the plot. This review contains mild spoilers, so I’d suggest watching the movie before reading on. Set in 1984, the main story follows programmer Stefan Butler as he tries to make a video game out of Bandersnatch, a choose-your-own adventure book that drove its author mad. Stefan starts out the story with an interview from Tuckersoft, an up-and-coming video game publisher. Working there are Mohan Thakur, the pushy yet energetic owner, and Colin Ritman, a mysterious, genius programmer whose every release is a hit. Stefan pitches them the idea of Bandersnatch, and they bite, giving him time and resources to produce it for an upcoming Christmas release. Throughout the rest of the story, Stefan must deal with the project’s slowly encroaching deadline, as well as his relationship with his father and his own mental demons. What I like about Bandersnatch is that it differs from a typical Black Mirror flick. It doesn’t introduce a revolutionary new technology, it doesn’t play with a dystopian or otherwise altered society. Rather, it asks ethical and philosophical questions of it’s viewers: When does following orders go too far? Are we ever truly in control? What is better, free will or devout obedience? By making the audience choose the direction of the film, the movie makes the viewers part of the film itself. They get to ask themselves whether they are truly watching the life of Stefan, or looking closely at their own personal choices. In addition to all of that, the amount of work that went into this film is staggering. Charlie Brooker, the creator of Black Mirror, wrote a 170-page script for the film, which ended up delaying season five of the Black Mirror show. While the average view time of Bandersnatch is 90 minutes, Netflix reports that there are around 150 minutes of unique footage, with five main endings. When viewers reach an ending, they are usually given one or two choices earlier in the film to go back and redo, to hopefully find another pathway of the plot. However, the five distinct endings may not be all the movie has to offer. 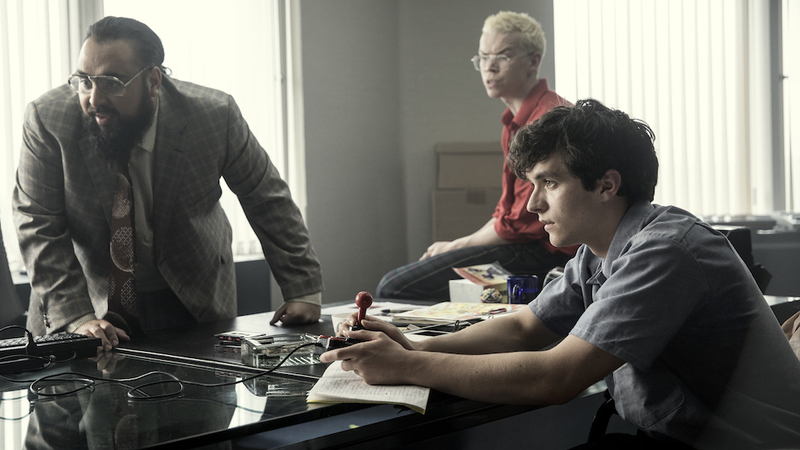 Booker and the cast of Bandersnatch revealed that there is footage hidden behind complex combinations of choices, and that it may never be seen. All said and done, I enjoyed Bandersnatch. It was a novel way to watch a movie, and I’ll certainly give Netflix props for trying out a new way to experience television. However, Netflix is currently being sued by the creators of the Choose Your Own Adventure series, who argue the idea was theirs to begin with, and that Netflix shouldn’t be allowed to use it. I recommend you watch Bandersnatch soon if you haven’t already, as it could be here today and gone tomorrow.